I AM THE BREAD OF LIFE; WHOEVER COMES TO ME WILL NEVER HUNGER. The journey from slavery to freedom is never an easy one. The transition from the physical to the spiritual is part of that journey. 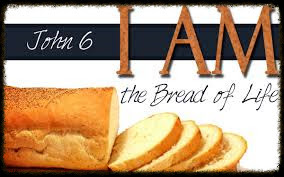 Our readings for the next four weeks center around the Bread of Life Discourse in John, chapter 6. In it, Jesus takes us on the journey from the physical to the spiritual. Jesus himself is the food that will sustain us on the journey. In our first reading (Exodus 16:2-4, 12-15), the Israelites are just beginning their journey from slavery to freedom. Life is hard in the desert and they grumble. God demonstrates his love and care for them by giving them food for the journey. The whole Israelite community grumbled against Moses and Aaron. The Israelites said to them, "Would that we had died at the LORD's hand in the land of Egypt, as we sat by our fleshpots and ate our fill of bread! But you had to lead us into this desert to make the whole community die of famine!" Then the LORD said to Moses, "I will now rain down bread from heaven for you. Each day the people are to go out and gather their daily portion; thus will I test them, to see whether they follow my instructions or not. "I have heard the grumbling of the Israelites. Tell them: In the evening twilight you shall eat flesh, and in the morning you shall have your fill of bread, so that you may know that I, the LORD, am your God." In the evening quail came up and covered the camp. In the morning a dew lay all about the camp, and when the dew evaporated, there on the surface of the desert were fine flakes like hoarfrost on the ground. On seeing it, the Israelites asked one another, "What is this?" for they did not know what it was. But Moses told them, "This is the bread that the LORD has given you to eat." Our Gospel reading (John 6:24:35) immediately follows last week's Gospel where Jesus fed the five thousand with five loaves and two fish. In this reading, the crowd followed Jesus to Capernuam. Their bellies filled with food, they look for another physical miracle. Jesus responds by telling them to focus not on the "food that perishes but the food that endures for eternal life." "I am the bread of life", says Jesus. When the crowd saw that neither Jesus nor his disciples were there, they themselves got into boats and came to Capernaum looking for Jesus. And when they found him across the sea they said to him, "Rabbi, when did you get here?" Jesus answered them and said, "Amen, amen, I say to you, you are looking for me not because you saw signs but because you ate the loaves and were filled. Do not work for food that perishes but for the food that endures for eternal life, which the Son of Man will give you. For on him the Father, God, has set his seal." So they said to him, "What can we do to accomplish the works of God?" Jesus answered and said to them, "This is the work of God, that you believe in the one he sent. "So they said to him, "What sign can you do, that we may see and believe in you? What can you do? Our ancestors ate manna in the desert, as it is written: He gave them bread from heaven to eat." So Jesus said to them, "Amen, amen, I say to you, it was not Moses who gave the bread from heaven; my Father gives you the true bread from heaven. For the bread of God is that which comes down from heaven and gives life to the world." So they said to him, "Sir, give us this bread always." Jesus said to them, "I am the bread of life; whoever comes to me will never hunger, and whoever believes in me will never thirst." In our Epistle reading (Ephesians 4:17, 20-24), St. Paul encouraged the Christian converts in Ephesus to continue their journey from the old ways of the Gentiles to the new ways in the spirit of Christ. Take off the old clothes of deceitful desires and be renewed in the spirit. We, in this life, are on no less a journey than the ancient Israelites in the desert grumbling about food, or the Ephesians in the process of conversion from their old self to their new self. As Jesus tells us in today's Gospel, we should worry less about the things that satisfy our earthly desires and more about what will sustain our spirits for the journey to eternal life. As we progress through the next four weeks, we will learn precisely who and what will nourish and sustain our spirits.